Thomae Ludovici de Victoria. Abulensis. 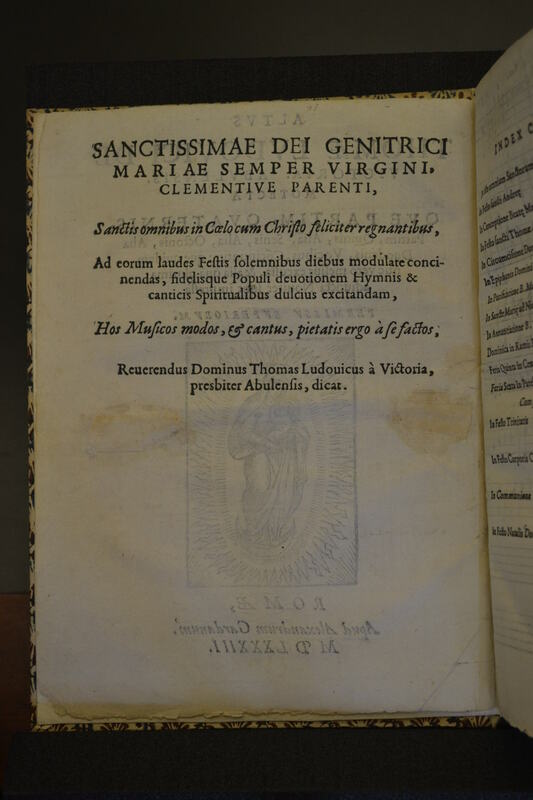 Motecta que partim quaternis, partim quinis, alia senis, alia octonis, alia duodenis vocibus, concinuntur: quae quidem, nunc vero melius excussa, et alia qua plurima adiuncta. Noviter sunt impressa. Permissum superiorum. Romae. Apud Alexandrum Gardanum. MDLXXXIII. Eight notebooks, one for voice. 20 x 10,5 cm. 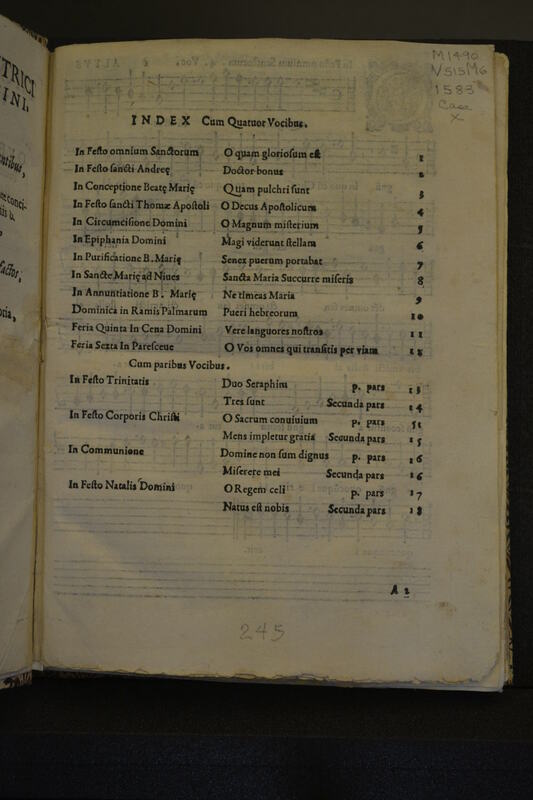 As in the 1572 edition, which is reissue, the motets are divided into groups, with a corresponding index, depending on the number of voices, and within each group are sorted by the liturgical calendar. 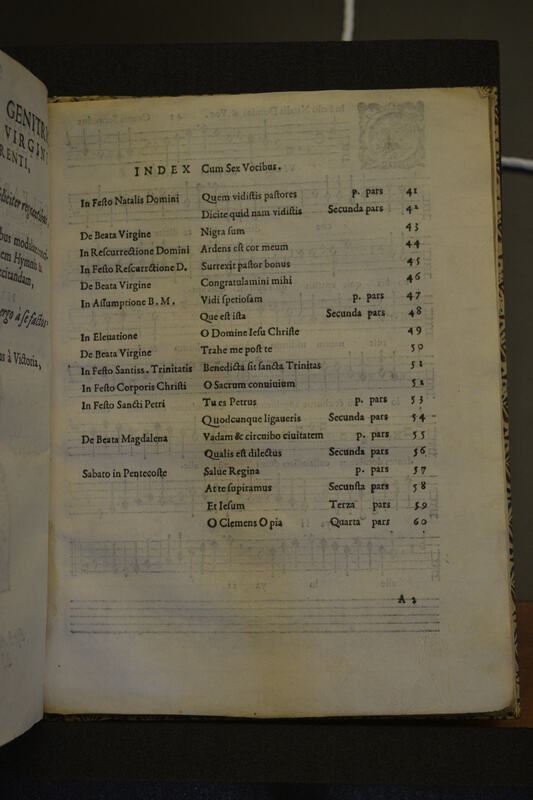 This edition includes 20 new parts compared to that of 1572, while 7 of which had already appeared in intermediate editions to both. 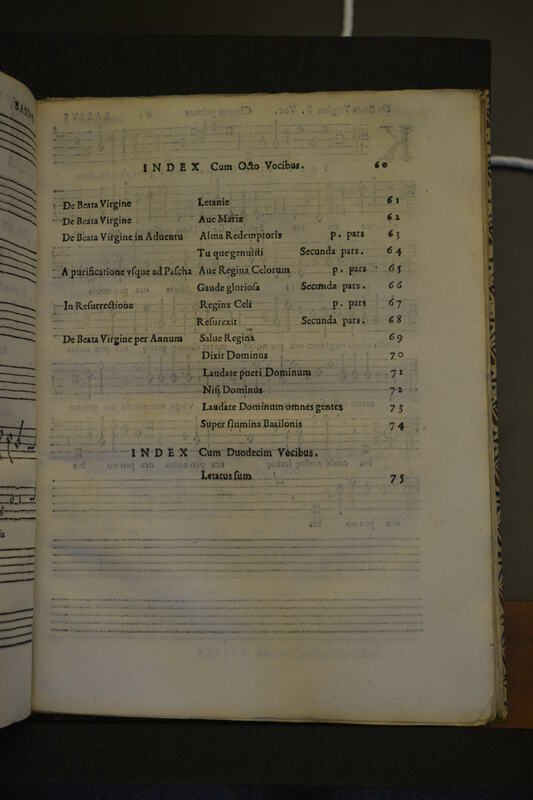 Cover: Image from the specimen at University of California Music Library and Bancroft Library, Berkley (USA) digitized by Nacho Álvarez©. The Reverend Tomás Luis de Victoria, priest from Avila, dedicates to the Saint Mother of God, Saint Mary the perpetual Virgin or to her merciful Father, or to all the saints who happily reign in heaven with Christ, to sing their praise on solemn festivities and to inspire faithful people’s devotion through hymns and sacred songs composed by him. Image from the specimen at University of California Music Library and Bancroft Library, Berkley (USA) digitized by Nacho Álvarez©. Images from the specimen at University of California Music Library and Bancroft Library, Berkley (USA) digitized by Nacho Álvarez©. Archivo musical de la Capilla Real de Granada, Granada, (Spain). Incomplete. Archivo capitular de Tarazona, Tarazona, (Spain). Complete. University of California Music Library and Bancroft Library, Berkeley (USA). Incomplete. DIGITIZED SPECIMEN by Nacho Álvarez©. Archivo de la Catedral, Bogotá (Colombia). Incomplete. Archivio del Duomo, Florence (Italy). Biblioteca del Seminario Arcivescovile presso di Curia, Lucca (Italy). Incomplete. Biblioteca Nacional, Ancient Fonds du Conservatoire National de Musique, Paris (France). Incomplete. Bischöfliche Zentralbibliothek, Regensburg (Germany). Two incomplete copies. From the library of Karl Proske. Archivio di San Giovanni in Laterano, Rome (Italy). Complete. Biblioteca dell'Academia Musicale Ghigiana, Rome (Italy). Incomplete. 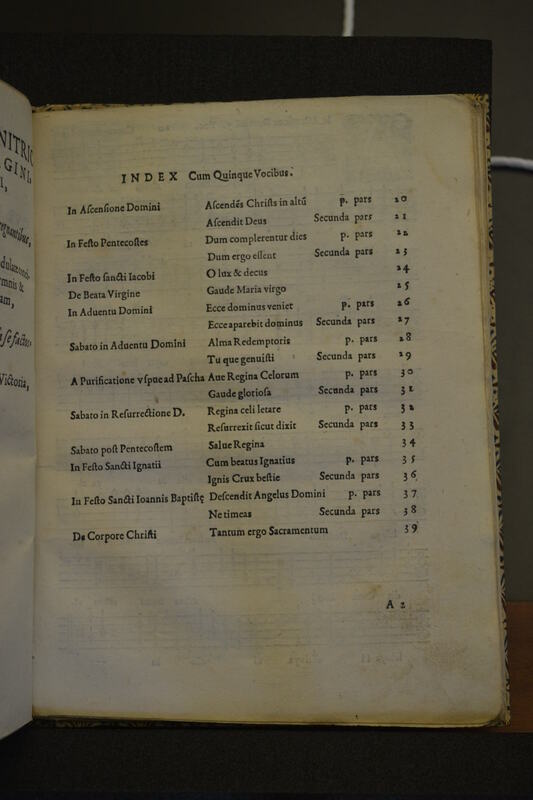 Soterraña Aguirre gives another reference from a specimen from Archivo Diocesano, Valladolid (Spain). Music section of the Cathedral. Document: Book of parts 26bis . Incomplete (5 of the 8 notebooks).